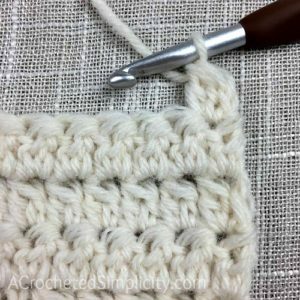 When we first learn to work the double crochet cluster stitch, we learn to begin the first cluster stitch of the row with either a chain 2 or a chain 3. While these methods are great when we’re first learning, eventually we begin to notice that both of them cause unsightly gaps in our work and we look for ways to get rid of these gaps. 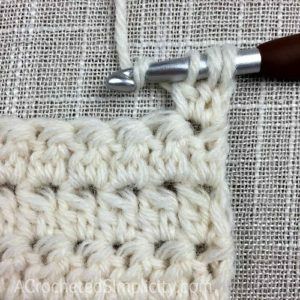 This is why I came up with the Alternate Double Crochet Cluster Stitch! 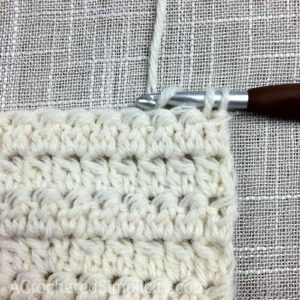 It is a great new stitch to add to your crochet toolbox! No unsightly gaps at the beginning of your rows! It creates a nice clean edge along your work. This is especially helpful if you need to add a border to your project. I also use this when working in joined rounds. 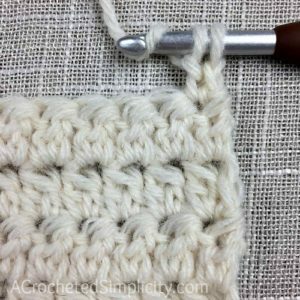 It eliminates the gap you get when you have a ch 2 or ch 3, double crochet cluster in the first stitch. 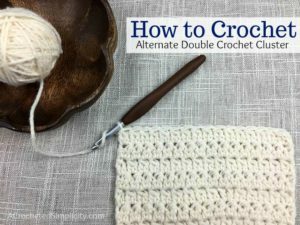 This is my go-to way to work an alternate double crochet cluster stitch and I use it every time I need to begin a row or round with a 2 double crochet cluster. 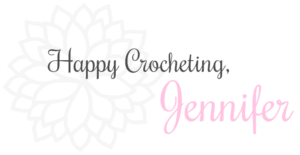 I LOVE how something SO simple can make such a huge difference in my work! 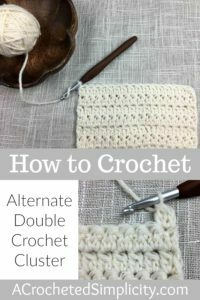 Do you need to work an alternate double crochet stitch instead? 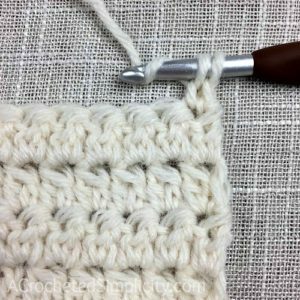 Click HERE for my Alternate Double Crochet Stitch Tutorial! 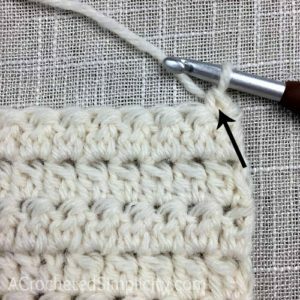 If you need a detailed tutorial on how to work a regular 2 double crochet cluster stitch, click HERE for my tutorial. 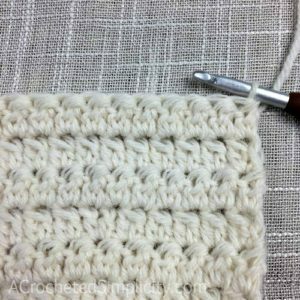 Let’s begin a row with an Alternate Double Crochet Cluster Stitch! Set-Up: I grabbed a ball of Lion Brand Wool Ease / worsted weight 4 & a Clover Amour 6.00mm crochet hook. I chained 17, then worked a sc in the 2nd ch from my hook and in each ch across. Step 1: Turn your work to begin a new row, but DO NOT chain. Step 2: Work a single crochet stitch (without a turning chain), insert your hook into the first stitch, yo, pull up a loop, yo, pull thru both loops (see next pic). Step 3: See the black arrow? 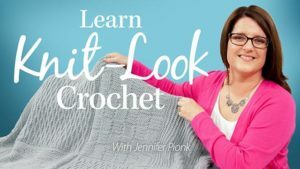 It’s pointing between the two legs of the single crochet stitch you just made. This is where you insert your hook in the next step. Step 4: Insert your hook between the legs of the single crochet stitch. Yo, pull up a loop, yo. Step 5: Yo, pull through one loop, yo. Step 6: Insert your hook into the same stitch, yo, pull up a loop, yo. Step 7: Pull thru two loops, yo. Step 8: Pull thru remaining three loops to complete the Alternate Double Crochet Cluster Stitch. 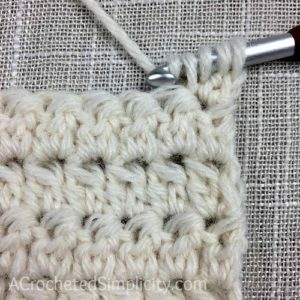 Finish up the row with regular Double Crochet Cluster Stitches, click HERE for the tutorial. Voila, you’ve just worked your first Alternate Double Crochet Cluster Stitch! 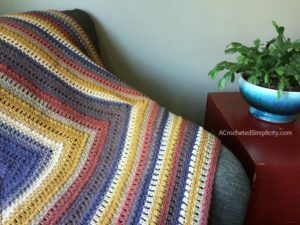 Practice this new stitch on my Centaur Mandala Afghan (pictured below).